Opt for a black lace tank and Jacob Cohen slim fit leather look jeans to be both knockout and relaxed. Black suede gladiator sandals will deliver a sportier vibe to your outfit. If you're scouting for a casual yet absolutely chic getup, try teaming a black leather biker jacket with black leather skinny jeans. Both garments are totally comfy and will look fabulous paired together. For a casually elegant outfit, opt for a brown fur coat and black leather skinny jeans — these two items fit really wonderful together. Look at how well this ensemble pairs with black leather ankle boots. If you're looking for a casual yet stylish look, opt for a grey coat and Jacob Cohen slim fit leather look jeans. Both items are totally comfy and will look fabulous paired together. Go for a pair of pink suede low top sneakers to make the look more current. If you're on the hunt for a casual yet totally chic outfit, wear a light violet coat with Jacob Cohen slim fit leather look jeans. Both items are totally comfy and will look fabulous paired together. For a more relaxed take, go for a pair of black leather slip-on sneakers. 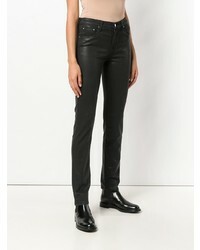 If you're on a mission for a casual yet totally chic ensemble, dress in a grey dress shirt and Jacob Cohen slim fit leather look jeans from farfetch.com. Both garments are totally comfy and will look fabulous together. If you're after a casual yet absolutely chic outfit, dress in a black and white print crew-neck t-shirt and Jacob Cohen slim fit leather look jeans. Both garments are totally comfy and will look fabulous together. Up the ante of your outfit with black suede pumps. If you're on a mission for a casual yet totally stylish outfit, team a tan wool blazer with Jacob Cohen slim fit leather look jeans from farfetch.com. Both garments are totally comfy and will look fabulous paired together. When it comes to shoes, this look pairs really well with black leather knee high boots. If you're obsessed with relaxed dressing when it comes to fashion, you'll love this totally stylish combination of a black print denim jacket and black leather skinny jeans. Dress up this ensemble with black suede ankle boots.